You screwed up. Things went too far. You had an affair. And now, you want to make things better. Rebuilding after an affair can feel more daunting than surviving another Snowpocalypse. Cars getting stranded on Lakeshore is no match for how intimidating, isolating, and cold this feels. But, much like a Chicago winter, you’re holding out for the thaw. It is the light at the end of the tunnel—spring flowers, beach days, connection and intimacy—that helps us persevere through the iciness. So, in many ways, recovering from an affair is like surviving winter. If you can get through it, you’re rewarded with fresh beginnings and street festivals. The person who had the affair is ready to move into spring—hope, revival, joy. They want to put the past in the past and move forward with their lives. Just like Chicagoans in March, they are desperately ready for winter to be over. It’s lasted long enough. However, like Chicago in early spring, their partner is firmly in winter and oscillating between angry outbursts and blasts of tears. And, just when there’s been a thaw, the icy glares resurface. It’s disheartening. Like the cold day after the warm snap. As a couples therapist, I do a lot with affair-recovery work. When these couples come to my office, the partner who had the affair often expresses their desire to move past it. There is an aspect of desperation. The feelings of guilt and shame are tying their stomach into knots. And the disconnection in their relationship is making it hard to keep trying. What I do is help couples slow down, attune to their partners, and utilize tried-and-true strategies that foster healing and connection. Because, if you’re like the couples that I work with, you want things to get better. You want to be happy in your relationship. To get to a place that you both feel valued, supported, and heard, you need the right guidance. Unfortunately, many couples don’t get the help that they need and end up feeling stuck and hopeless. A kind of “dammed if I do, dammed if I don’t” kinda place. Now I’ve got a sneaky feeling that this isn’t where you want to be. My guess is that you’re looking to heal, repair, and reconnect and that stuckness is not for you. So if you’re looking for a path forward, you’re in the right place. Recovering after an affair is hard. But, using proven strategies, it is entirely possible to rebuild trust and connection in your relationship. Keep reading for 8 tips so you can start healing your relationship and work towards reconnecting with your partner today. What Happens to your Relationship after an Affair Ends? Three things can happen. Your relationship can end abruptly, it can slump along for awhile, or you two can heal past hurts and have a mutually satisfying relationship. Ultimately it’s up to the two of you. The choice is yours. So if you’re reading this I’m going to assume that your partner hasn’t walked out (yet). If they have, you might want to download my Marriage Saving Guide and Checklist. While it’s not geared towards affairs specifically, it’s a good guide to helping a relationship that’s on the brink of divorce. So what are your options if they haven’t left? You can ignore the problems, try to work things out on your own, or get guidance on how to move forward. Because of the delicateness of affairs and the breach of trust, I generally recommend seeking a qualified couples therapist who can help. Not only can couples therapy help your relationship heal from the affair but it can help you make it stronger and better than ever before. But, if nothing else, follow proven techniques to rebuilding a relationship after cheating. Do not skip this step. Finding out WHY the affair happened is a critical piece to being able to move on in your relationship. If you don’t know why the affair happened, you cannot affair-proof your relationship. And your partner is going to need to know that things will be different going forward. So think through what lead to the affair. What was going on in your life and/or relationship that made an affair a possibility? If you’re unsure, you can check out this post on “Why Do People Cheat?” and see what reason resonates with you. But don’t stop there. Really dig into the why and think through what you do differently next time. Love means ALWAYS having to say that you’re sorry. Your partner needs to hear that you’re sorry that you cheated, that you hurt them, and that you both are now in this situation. Otherwise you run the risk of seeming like you’re just sorry that you got caught. That is no way to repair a relationship. Now this is not a one and done “I’m sorry.” As your partner goes through the emotional rollercoaster that is learning about and healing from infidelity, they will need to hear “I’m sorry.” A lot. Because they need to know that you really are very, truly sorry. And that it’s not going to happen again. Your partner’s biggest fear is that this will happen again. They don’t want to be made a fool. So if they’re going to take you back and work this out they need to hear that you won’t ever do this again. Without these assurances, your chances of healing from the affair are slim. You’ll need to promise that you won’t cheat and give assurances that things are different this time around. You can let them know that you screwed up and that you’re sorry. And tell them why it happened and what you’re doing differently this time. If you need more pointers, check out my post on 3 Signs Your Partner has Kicked Cheating to the Curb and feel free to share it with your partner. I know that it is hard to talk with your partner about what happened, especially when it seems like everything you share hurts them more than it helps them. But your partner is trying to make meaning of what happened. They are trying to wrap their heads around why and how this could have happened. So, hard as it is, they need you to answer their questions. This is part of the healing process and a test. You withheld a lot of critical information from them when you had the affair. Right now, they need to know that you can be open and transparent. It won’t go on like this forever. But definitely expect it to go on like this in spurts. Answer as openly and honestly as you can without going into graphic detail. If your partner is going to work through this, they are going to need to know that you are in it with them. They don’t want to be played for a fool (again). In order for them to move towards trusting you again, you have to illustrate that you are trustworthy. And you can do this by reassuring that you are committed to them and the relationship. Let your partner know that you are a 100% committed this time around. And ask them what they need to see and hear from you to show that you’re in this, you’re not going to cheat, and that this relationship is worth working on. It generally takes 9-12 months to recover from an affair. Sometimes, because the hurt hasn’t been addressed, affair wounds can fester for years. If you’ve found that it’s been longer than a year, you definitely want to seek a qualified couples therapist who can help. Even if it’s been less than a year, couples therapy can expedite the healing process. No matter if you try to work this out on your own or with a trained professional, expect things to be bumpy. Affairs rock the foundation of a relationship. And rebuilding that takes time and a lot of work. While it’s entirely possible to create a happy, healthy relationship after an affair, it’s not going to be easy. 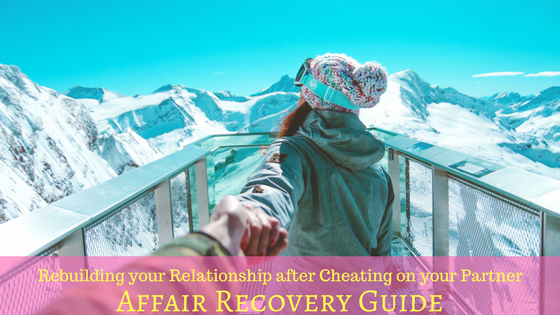 You’ll have ups and downs as you and your partner navigate life after the affair. There are times when things will feel normal and other times when you wonder if things will ever be normal again. Be patient. Rebuilding trust is a tall order. It takes time. And your partner needs your patience as they work through the emotions. After an affair, you go into the process of rebuilding the primary relationship. It is important for both you and your partner to address the changes you’d like to see in the relationship. While this is an important and crucial step, I listed it last for a reason. When I work with couples, addressing the changes they hope to see in the relationship comes after healing hurts from the affair. So don’t jump into this too soon. Focus first on connecting and comforting your partner. And, then when you two are ready, start to have conversations about your future. Ready to help your relationship heal after an affair? Schedule Your FREE 15 minute phone consultation!